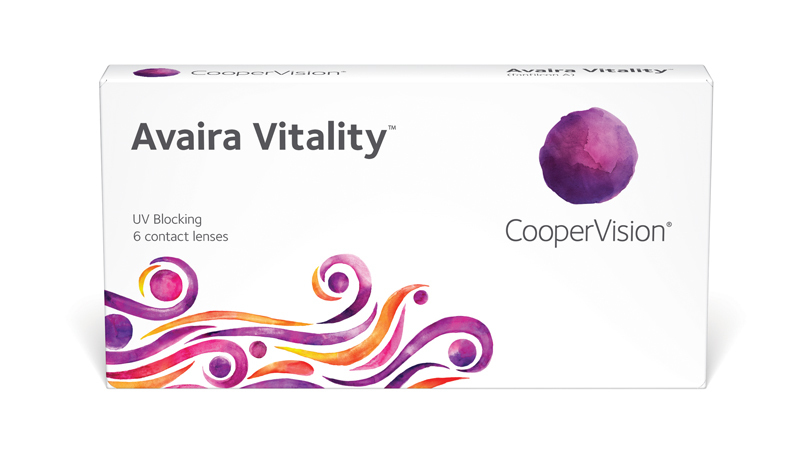 Avaira Vitality™ contact lenses provide clear, crisp vision using the same proven optical design features employed by world-renowned Biofinity® contact lenses. With its’ convenient 2-week replacement schedule and soft, flexible material, Avaira Vitality contact lenses are just what your patients need. Ultraviolet radiation can be harmful to eyes, with the potential to cause cataracts and other damage.2 The Class 1 UV blocker1 in Avaira Vitality contact lenses blocks more than 90% of UVA and 99% of UVB rays, the highest level of UV protection available in a contact lens. That’s added peace-of-mind UV protection for your patients’ eyes. Avaira Vitality contact lenses are made with highly breathable silicone hydrogel material providing your patients with the healthier lens wearing experience3 they deserve. The lens achieves high Dk (90) with only 4.7% silicone content—the lowest silicone content of any 2-week SiHy contact lens, allowing more room for water (55%) and hydrophilic components. Evenly spread throughout the lens, these components keep the entire lens surface continuously moist throughout the day. Avaira Vitality contact lenses provide the long-lasting comfort your patients demand thanks to natural wettability, high water content, low modulus, and a rounded-edge design. 1. Available in a contact lens. Warning: UV-absorbing contact lenses are not substitutes for protective UV-absorbing eyewear, such as UV-absorbing goggles or sunglasses, because they do not completely cover the eye and surrounding area. Patients should continue to use UV-absorbing eyewear as directed. 2. American Optometric Association. UV Protection with Contact Lenses. 2017. 3. With higher oxygen permeability than hydrogel lenses, silicone hydrogel contact lenses minimize or eliminate hypoxia-related signs and symptoms during lens wear.